Can automation rules be used in Pardot too? Yes! Automation rule is something that allows you to perform actions based on settings and conditions you specify. Just as you can create Process Builder or Workflow Rule in Salesforce to automate your business processes; similarly, in Pardot, you can create Automation Rule to better manage your prospects or email lists. There are, however, few differences between Automation Rule in Pardot and in Salesforce. In this post, I am going to cover few use cases of Automation Rule in Pardot. There is obviously a lot more complexity you could add to your automation rules and set up; but, we will start with pretty basic concepts and then build up from there. How does that sound? Pardot mainly has four automation tools – Automation Rule; Segmentation Rule; Completion Action; and, Dynamic List. People, however, have hard time understanding when to use which automation tool in Pardot. In this article, I will share with you the basics of these tools and its purpose. Automation Rule: – It allows you to create a rule that evaluates your prospects database against defined criteria. Automation Rule will only fire once for a prospect record in the lifetime. Automation Rules are retroactive and will apply to all prospects created in the past. Segmentation Rule: – It allows you to create a one-time static list of prospects using chosen criteria. For example, you have 13k prospects in your database. And, you are planning to send a marketing email to all prospects that reside in Milwaukee area. To create such a static list for one-time use, you can use Segmentation Rule. Completion action: – It allows you to add actions to marketing assets (Form, Form Handlers, Files, Custom Redirects and Page Actions, etc.) that fire after a prospect takes action. Completion actions are not retroactive and will only apply to prospects moving forward once you add them. Completion actions execute every time the action is completed except for adjusting the score. For example, you may want to send an autoresponder email when a prospect submits a form to download a white paper. Dynamic List: – It allows you to define criteria for list membership and, Pardot will do the rest. For example, you have created a list called Current Prospect. Currently, Raj Malhotra is part of this list. You are sending marketing contents to members of this list. However, just yesterday, Raj became your customer after purchasing your services. As a result, Raj is no longer a prospect but is now a customer! Since Raj is now a customer, you do not want to send Raj a marketing email that is targeted towards a prospect. To auto remove Raj from Current Prospect list, you have to first define this list as a dynamic list and then set criteria for membership. We will discuss Segmentation Rule, Completion Action and Dynamic List in the upcoming articles. Automation rules allow you to perform certain actions on prospects based on criteria you specify. Automation Rule will only fire once for a prospect record in the lifetime. Automation Rules are retroactive and will apply to all prospects created in the past. Automation rule fires on every ten minutes for prospects who match the rule criteria. It touches a matched prospect only once. Automation rules are retroactive and touch the prospects that were created in the past if they meet rule criteria. It starts with paused state and provides the preview to show how many prospects will match this rule. Deleting an automation rule will not undo the actions of matched prospects. It is possible to add multiple actions to an automation rule. The following screenshot display list of actions available under Automation Rule. These may vary based on connector setup. For example, if you do not setup Salesforce CRM connector then you will not see actions related to Salesforce CRM. In our scenario, select Match All as we have only one rule criteria i.e. country equals United States. –> You can pause and resume the rules at any time. –> Standard Edition accounts can have up to 50 automation rules at any given time. Pro Edition accounts can have up to 100 automation rules and Ultimate Edition accounts can have up to 150 automation rules. Automation rules that have been deleted, and are in the recycling bin, do not count towards this number. 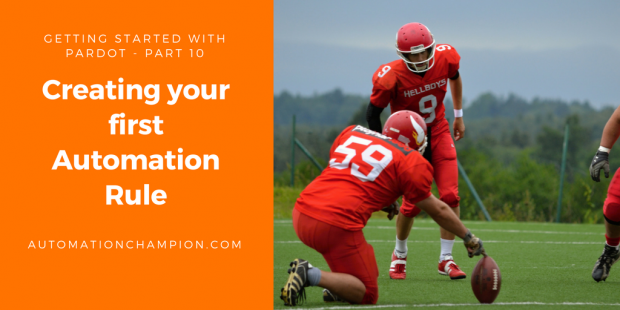 In my next blog, I will take a deeper dive by showing you how to create gated content using completion action.